The holidays are over just as fast as they arrive, and we can all agree cleaning up and tearing down after the festivities, food, and family gatherings is one of the last things you want to tackle. Make the packing process a breeze this year with these decoration packing and organizing tips. You can return to relaxing in no time. 1. Get everyone involved – Packing up Christmas goes by much quicker with some helping hands! Choose a time when your family can get involved, and incentivize the crew with dinner or a movie afterwards. Post-packing plans will also give everyone something fun to look forward to! 2. Organize – Start by separating your decorations. This can be by category, such as outside and inside decorations, by room (living room, kitchen, and childrens’ rooms), or by the order in which you bring out the decorations. 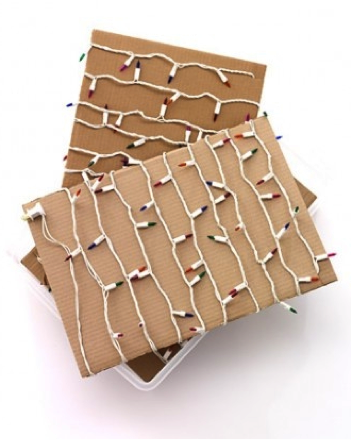 For instance, if your family usually strings lights right after Thanksgiving with the tree the following week, you can sort the decorations in that order and number each box for maximum time-saving. Choose the order that makes the most sense for your holiday habits. 3. Storage – Once your holiday décor and related materials are sorted, boxing them up should be quick. We recommend using the TWO MEN AND A TRUCK® dishpack box to store gift-wrapping supplies. The full instructions to utilize the box are here. 4. Recycle! – There are many ways to use all the leftover wrapping paper and boxes from the year. One simple way to pack Christmas tree ornaments is to wrap them in used wrapping paper or bubble wrap and nestle them in the TWO MEN AND A TRUCK® dishpack box. The paper will protect ornaments and the special dividers keep them separated. Did anyone in your household get new shoes for Christmas? Use the silica gel packets that come inside shoe boxes to place inside your Christmas decoration boxes. They keep the humidity out and allow your decorations to last even longer. 5. Label, label, label – Nothing is more frustrating than searching through box after box looking for one specific item. Make this process less stressful and save yourself some time next holiday season labeling items found in each box! 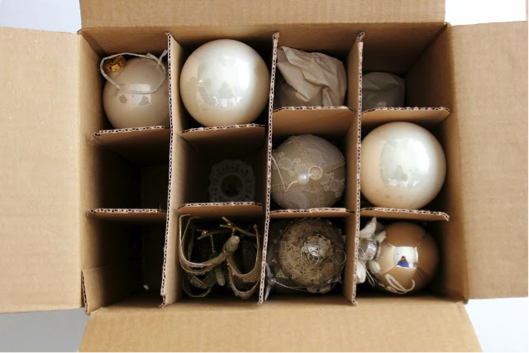 Do you have any great decoration packing tips to share? Leave a comment below and let us know. Have more to pack? TWO MEN AND A TRUCK® is here to move you forward with tips and answers to your packing challenges. We hope you enjoyed this holiday season with your family. Blessings to you in the New Year! One tip I learned is take a photo of the way you set up a room and put all those decorations in that box. Once packed up, tape the photo to the outside so you know what’s in the box and remeber how you liked it set up best. Some really good advice. If the customer is paying hourly, the best tip you can give is be prepared. The most costly moves are the relocation where nothing has been prepared and there is still a large volume of packing still to be done.